Many girls from poor rural areas become little maids, petites bonnes, working as domestic servants for families in the cities. For families struck by extreme poverty they see this as an opportunity. A chance for their daughters to be sent to good homes where they believe they will be treated well and sent to school to be educated. What is disturbing are the numbers of girls out of an estimated one million, 25% who are under the age of 10, that are not from the fortunate ones. Girls who have to work long hours, with no breaks or rests, receiving very little pay, denied of any sort of access to education or medical care, and only seeing their families once or twice a year, if that. Of the worse off are those who are victims of psychological and physical abuse. It is not surprising that many of these young girls become runaway child maids, turning to the streets as they have nowhere else to go. ‘Police found the 10 year old child huddled on a dusty curb, her head shaved, her small frame dwarfed by an oversize apron. Her malnourished limbs were purple with burns and bruises...."
‘Aicha had just escaped from a home where she worked as a little maid. After five years of scrubbing floors, tending babies, washing clothes and being slapped and humiliated for her every misstep, the girl told authorities that she took to the streets. 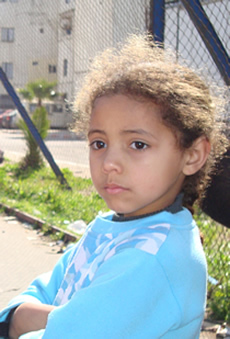 For the next four months she lived at the Centre Bennani in Casablanca, Morocco's only detention center for girls--a multipurpose facility that offers social services and foster care, and also serves as a juvenile detention center where little girls such as Aicha live side by side with under-18 drug dealers, prostitutes, even murderers. Seventy percent of the 236 girls boarded in the facility--designed for 150--are former child maids. At least Aicha was no longer being hurt, and she even started learning to read, play games and make friends. But then she grew ill. A brain tumour began to wither her already frail body, and she ended up in a Casablanca government hospital. Despite bedside pleas from her caregivers, she refused to offer any hints of her origins beyond her father's first name. All they knew was that she was a Berber, and that her accent was most likely from the High Atlas Mountains. The Johns Hopkins University, School of Advanced International Studies.